FOR DECADES 3M was the primary producer of C8, or PFOA, and was the sole producer of a related chemical known as PFOS. But while DuPont was caught up in a massive class action suit over C8, 3M has largely avoided public scrutiny and serious legal or financial consequences for its role in developing and selling these industrial pollutants. In February, however, a state court in Minnesota, where the company is headquartered, allowed a lawsuit against 3M to move forward. And late last year lawyers filed a class action suit in Decatur, Alabama, home to one of 3M’s biggest plants. Both lawsuits charge that 3M knew about the health hazards posed by the perfluorinated chemicals it was manufacturing and using to make carpet coating, Scotchgard, firefighting foam, and other products — and that the company knew the chemicals were spreading beyond its sites. With PFCs cropping up in drinking water around the country and all over the world, the two lawsuits raise the possibility that 3M may finally be held accountable in a court of law. State Attorney General Lori Swanson first filed the lawsuit against 3M on behalf of the people of Minnesota in 2010, claiming that the company polluted more than 100 square miles of groundwater near its plant in Cottage Grove Minnesota as well as four aquifers serving as drinking water for some 125,000 people in the Twin Cities. The suit charges that the company piped PFC-polluted wastewater into a stream that flows into the Mississippi River and disposed of it on land near the river, which allowed it to leach into the river. Ariel view of the 3M plant in Cottage Grove, Minnesota. After the initial discovery of PFCs in drinking water near the Cottage Grove plant, 3M installed filtration systems on the water supply for the nearby community of Oakdale, provided bottled water for residents with private wells, and remediated three of its former dump sites. However, the most recent water tests, released by the EPA in January, still showed 25 detections of PFCs in wells that provide drinking water to Woodbury, Oakdale, and Hastings — which all are near 3M headquarters — as well as in the Cottage Grove water utility, which serves more than 33,000 people. In two wells in Oakdale, Minnesota, PFOS contamination detected by EPA tests released in January exceeded the provisional health levels set by the agency. And several Oakdale wells had PFOA levels higher than those that qualified residents to participate in a class action suit against DuPont in West Virginia and Ohio. In Minnesota, however, Judge Mary Hannon, determined that state law did not permit medical monitoring claims to be pursued in class-wide suits. So while the West Virginia suit yielded a $343 million settlement and led to the medical monitoring of tens of thousands of exposed people, which in turn allowed epidemiologists to find probable links between C8 and six diseases, the case in Minnesota on behalf of people who had PFCs in their wells involved no medical monitoring. Judge Hannon ruled that plaintiffs’ lawyers could not even mention the possibility that the chemicals posed any harm. Ariel view of the 3M plant in Decatur, Alabama. Meanwhile, in Alabama, where the most recent EPA testing found PFCs in 87 water samples, 3M has benefited from another series of legal near misses. One class action suit filed in 2002 was stayed until last year, when 3M and the plaintiffs agreed to begin the mediation process. Two others have been put on hold pending the outcome of the first. 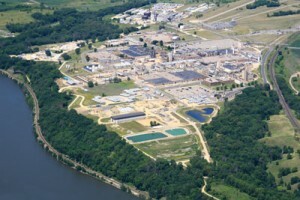 The most recent class action suit against 3M in Decatur, filed last October by Davis & Whitlock, seeks damages for the customers of the West Morgan-East Lawrence Water and Sewer Authority, whose drinking water has been tainted with PFCs. This suit argues that 3M emitted PFCs into the nearby wastewater treatment plant, which in turn discharged them into the Tennessee River. According to the complaint, 3M was dumping chemicals into river and soil despite having known since 1986 that it needed to dispose of them in lined landfills or by burning. The suit also charges the Japanese Company Daikin America with contaminating water, but calls 3M’s Decatur plant “the primary source” of PFOA and PFOS in the Tennessee River and the Decatur area. An earlier version of this story incorrectly referred to the 2010 Minnesota lawsuit as a class action lawsuit. We regret the error.